Thanksgiving is days away and if you’re like every other American you can’t wait to chow down. 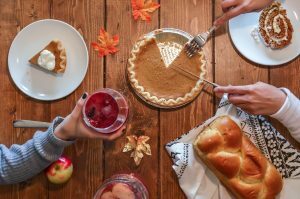 During this time of thanks & celebration, we tend to not worry about our health or the calories we are putting in our bodies. Americans consume anywhere from 3,000 to 4,500 calories at Thanksgiving celebrations, which on a normal day is around 2,360. Not to mention that you usually go back for seconds, a Thanksgiving meal if not at least considerate will have you with some regret the next few days. Today we will share some tips, food ideas, and more that can help make your Thanksgiving a little more health conscious. What does your normal Thanksgiving meal look like? Turkey, cornbread, mash potatoes, stuffing, and don’t forget about the dessert. If you are worried about overeating a good rule of thumb is to take half portions of what you usually eat, so you don’t have to miss out on any particular food. Another tip for those who end up waiting longer than expected make sure you watch your snacking. There should be some type of fruit which is a healthier snack to than all those Hawaiian rolls you’ve been eating. Are you someone who enjoys drinking a little alcohol never hurts someone, but if you are someone who goes a little harder, stop and consider cutting the drinking altogether. Drinking is empty calories and if avoided all together you can save yourself from a headache and a bloating feeling. This goes for soda as well. Socializing before meals can actually help you burn calories and avoid eating at the same time. Talk to your family and friends see what’s new with them. This is great to remember if you catch yourself going back for more food when you’re really not hungry or prevent snacking before the food is served. Save your dessert for later. I know that eating your dessert right after your meal is always a great way to end it, but putting off the dessert until later on gives benefits like letting your food digest. It also gives you something to satisfy that craving that will eventually come. After your Thanksgiving meal, go for a walk or play some board games. Going to sleep right after you eat doesn’t help your digestive system do its job and although the nap sounds great it will be even better at the end of the night. The day after Thanksgiving is usually Black Friday and leftovers. Looking for a way to cut down on those calories you’ve been eating get out there and shop. All the walking you will do in the morning and throughout the day, by the time you get home the seconds of Thanksgiving will be calling your name. We hope these tips help you this Thanksgiving Holiday.